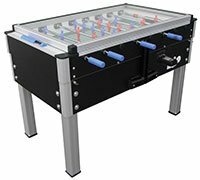 Glass top football tables are more often than not coin-operated, with the reason for the glass top being to stop players from blocking the goal or removing the ball and circumventing the payment method. However these tables do not always have to be coin-op, as the glass top also offers the advantage of keeping any spills / mess from entering the play field, so the table can be set to free-play giving the best of both worlds. On many tables the glass top barrier also eliminates the issue of ball loss, increasing the return on investment. This is accomplished by using a fully enclosed ball return mechanism that allows players to return the ball into play without being physically able to remove it.